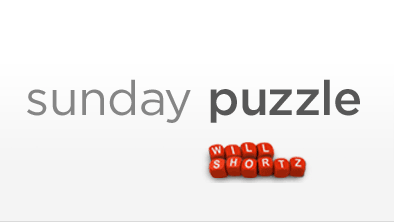 NOTE: Due to the Thanksgiving holiday, the deadline for this week's puzzle will be on Wednesday at 3 p.m. Eastern. On-air challenge: You'll be given two words. Change the first consonant sound in each word to the same new consonant sound and you'll phonetically name two things in the same category. For example, given "soxer," and "legal," you would say "boxer," and "beagle," which are both breeds of dogs. Last week's challenge: Name a country. Drop one of its letters. Rearrange the remaining letters to name this country's money. What is it? Winner: Richard McCurdy of Burbank, Calif.
Next week's challenge: The letters in the name of a major American city can be rearranged to spell a traveling cultural museum. What is it? Each name is a single word, and the city's population is more than a half million.